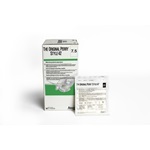 The Ansell Derma Prene Ultra surgical glove is powder-free and made from latex-free neoprene. It is a good choice for latex-sensitive (Type I) and chemical-sensitive (Type IV) health-care professionals and patients. The Derma Prene Ultra is dark green in color for instant identification as a natural rubber latex–free glove. 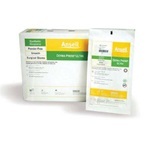 The Encore Acclaim is Ansell’s premier powder-free surgical glove made from natural rubber latex. The glove’s thickness allows for a comfortable fit and excellent tactile sensitivity during surgical procedures in a single- or double-gloving environment. Its smooth finish provides worry-free instrument and suture control, and its low allergen levels help reduce the risk of latex sensitization in health-care workers and patients. 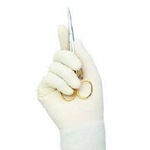 Encore surgical gloves are powder-free and made from natural rubber latex. The gloves have a textured finish for superior grip and handling, and their low allergen levels help reduce the risk of latex sensitization in health-care workers and patients. These latex gloves have a straight, reinforced cuff for extra coverage and protection on the forearm and a textured finish for superior grip and handling of instruments and sutures. 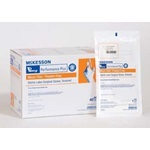 Powder-free to help eliminate powder-related post-operative complications and sensitivity. 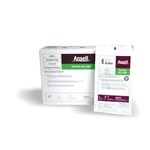 Ansell's Original Perry Style 42 powdered surgical gloves provide uncompromising quality and durability. Their satin-smooth finish provides maximum tactile sensitivity and is produced with advanced technology to lower powder and protein levels. 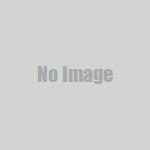 This product contains natural rubber latex, which may cause allergic reactions. 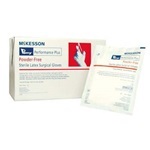 Perry Performance Plus micro-thin latex surgical gloves. Hand-specific, sterile, powder-free, polymer coating, brown gloves with a textured surface. Perry Performance Plus latex and neoprene surgical gloves. Various glove sizes that are hand-specific and intended for single use. Sempermed Supreme surgical gloves are anatomically designed to reduce hand fatigue and increase comfort. They are powder-free to eliminate aerosolization and skin irritation. A special multi-layer copolymer composition provides optimal protection during surgery. SensiCare revolutionized the medical glove industry as the first latex-free synthetic polyisoprene surgical glove on the market. Medline is the only surgical glove manufacturer that makes its own raw material polyisoprene, called Isolex, ensuring you a safe, quality product. Ansell Sensi-Touch powdered surgical gloves with a straight, reinforced non-beaded cuff for extra coverage and protection on the forearm. The glove’s latex formulation provides superior strength, and its design helps to reduce hand fatigue. Triflex sterile surgical gloves have an anti-slip finish for a firm grip and mechanically locking cuffs that prevent rolldown. Extensive rinse cycles on the gloves reduces latex allergens and proteins. Triumph Green latex powder-free surgical gloves are ideal when double gloving with Aloetouch Natural, Triumph or Triumph LT. Made from low protein natural rubber latex with synthetic polymer coating. All of Medline's powder-free gloves have a proprietary inner polymer coating, which allows for easy donning and double gloving. 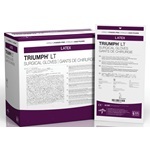 The Triumph LT Sterile Latex Powder-Free Surgical Glove is a standard-thickness glove that can be used alone or as an outer glove.